Now police are urging witnesses to come forward to help them catch the thug who carried out the “violent and unprovoked” assault in The Crown bar in the High Street just after 6pm. 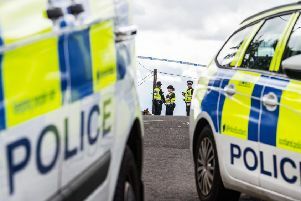 The 33-year-old victim was taken to Forth Valley Royal Hospital, where he was treated for serious face injuries. The suspect is tanned with short dark hair, stubble, of slight build and is 5ft 8ins. He wore a short-sleeved purple polo shirt, hip-length cream-coloured Burberry overcoat, jeans and black boots. He was with three other men at the time of the assault. Detective Inspector Paul Batten said: “This was a violent and unprovoked attack which has left the victim with a painful facial injury that will cause permanent scarring. “We’re asking anyone who recognises the decription of the suspect, or who may have seen him in the area of the High Street on Saturday evening, to get in touch. Anyone with information should contact Police Scotland on 101 or Crimestoppers on 0800 555 111. The pub was emptied after the attack and closed for the rest of the night, while two police cars and an ambulance were parked outside into mid-evening. The attack happened after the Linlthgow Rose game, when local pubs were typically busy. Management at The Crown have said the bar is involved in a local pubwatch system.